PathSpotChristine Schindler and Dutch Waanders, co-founders of PathSpot. 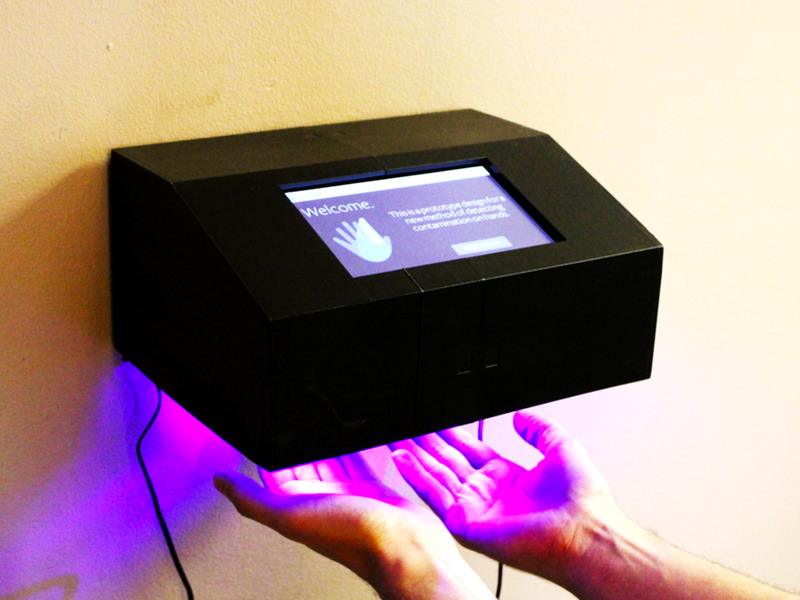 Two engineers have created a device called PathSpot that uses spectroscopy – that is to say, light – to help determine whether or not there’s bacteria on hands. They were inspired to follow this path by the E. coli outbreak at Chipotle from a few years ago. 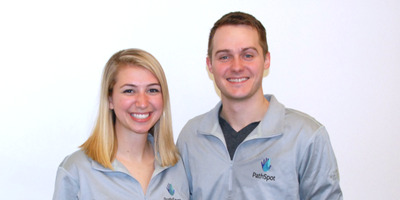 PathSpot’s co-founders say that the device could be used as the de facto form of sanitary regulation in hospitals, restaurants, airports, and schools in the future. Christine Schindler and Dutch Waanders have long been intrigued by dirty hands. Over the past year, the two co-founders have been working on a product that they say will showcase just exactly how germ-ridden our hands can be. Their consensus isn’t exactly a secret, either: It’s accepted as science fact that unwashed hands are typically covered in germs and that these bacteria can make us sick and contaminate our food. Schindler and Waander’s product is called PathSpot, a technology that uses spectroscopy – the study of the way light interacts with matter – to determine exactly how filthy our hands are throughout the day. PathSpot just graduated from the TechStars startup mentorship program in New York City, and is in the middle of securing more funding. The technology could provide a powerful asset to businesses that depend on keeping their workplaces bacteria-free. Currently, Schindler and Waanders have installed their product at 20 different farms, packaging facilities, and restaurants within the US. Since the beginning of the year, Schindler said that PathSpot has scanned more than 45,000 hands. In the future, the co-founders hope to make their product the de facto form of sanitary regulation in hospitals, restaurants, airports, and schools. And it all started with Chipotle. Schindler and Waander, who met during shared biochemical engineering classes at Duke University, were both studying the way that light interacts with objects. While Schindler was researching how light could be used to detect breast and cervical cancer, Waanders was using light to track stem cell treatments for osteoarthritis. But the pairs’ career trajectory shifted course when Schindler started reading up on the infamous E. coli outbreak at Chipotle restaurants. The controversy over Chipotle’s food safety practices inspired Schindler to research how foodborne illness spreads at restaurants. She discovered an off-putting trend: 89% of foodborne illnesses are the result of cross-contamination from hands that haven’t been properly washed. PathSpotPathSpot installs its device near hand-washing stations and bathrooms. A 2013 study from the Centres for Disease Control and Prevention reported that 62% of restaurant workers don’t wash their hands after handling raw beef. Schindler and Waanders decided to create a technology that could potentially determine whether or not someone’s hands are actually clean. Using circuitry acquired from a local Radio Shack’s going-out-of-business sale, the two worked on the device day and night over the course of several months. The result of Schindler and Waanders’ efforts is a small black box attached to a sensor-connected iPad. Place your hands beneath the device and it emits light on a certain wavelength. The iPad scans the light reflected by your hand, and runs a proprietary algorithm to analyse the way that it fluoresces. Waander and Schindler said that there’s a fundamental difference in the wavelength of light that fluoresces on a contaminated hand versus a clean hand. If bacteria is detected, the device flashes red. If your hands are clean, it emits a blue glow. PathSpotIf your hands are bacteria free, says Schindler, PathSpot’s device emits a blue light. One of PathSpot’s challenges is ensuring that the device, once installed, is consistently used by employees. To overcome this hurdle, PathSpot keeps extensive records on employees and tracks their interaction with the device via their employee ID numbers. Miss a few scans, and PathSpot alerts a manager. 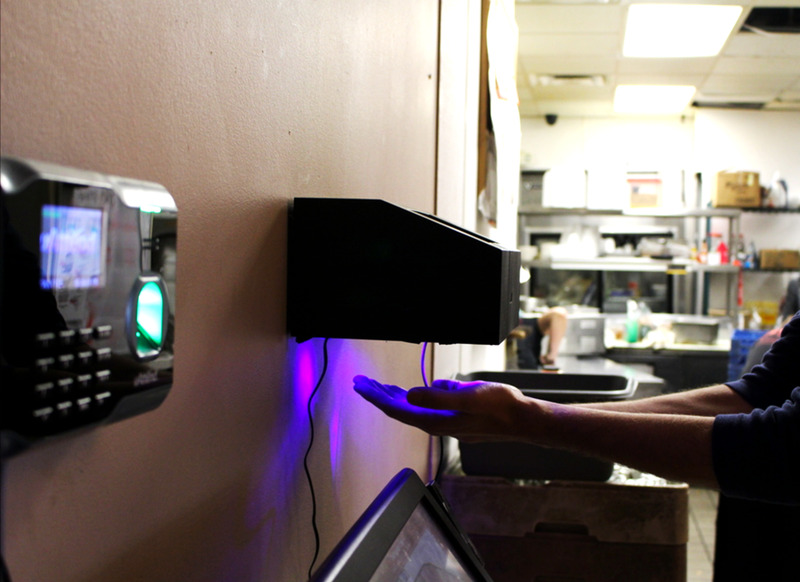 If an employee scans their hands with PathSpot and fails, then they have a few minutes to wash their hands again and re-scan them; if they don’t, PathSpot lets a manager know of a potential breach of food safety protocol. In the future, Waanders and Schindler hope to make a portable device that could attach to a smartphone, so that it could be used by individuals as well. When asked whether or not they have plans to meet with Chipotle, Schindler said that the Mexican fast food outlet is on the horizon, but that for now, they’re biding their time.